In the footsteps of Einstein, German scientists have made a breakthrough involving great expectations for an entirely new access to the universe. Research in the field of gravitational waves harkens back to a principle that Albert Einstein had discovered one hundred years ago. He realised that gravitation is not a force in the conventional sense; rather, it is a characteristic of space and time. In order to understand this, one usually simplifies the thought process from three-dimensional space down to a two-dimensional surface. Every kind of matter bends the space around itself; a celestial body thus lies more or less in a ditch, similar to an iron ball in a rubber cloth. All bodies – and even light – are forced to succumb to this bending phenomenon, which is perceived as the influence of an invisible force. Einstein foresaw that every kind of accelerated mass elicits waves – similar to a stone thrown into water. This is particularly true for heavy celestial bodies. From such gravitational waves, scientists are able to draw far-reaching conclusions regarding cosmic events. This is precisely where state-of-the-art research picks up: gravitational waves spread out at the speed of light and briefly shrink and stretch space wherever they appear – but only by as little as a fraction of the diameter of an atomic nucleus. What appeared for a long time to be immeasurable has now been made possible through the deployment of a special detector named LIGO. The detector in the USA enables measurements that heretofore appeared to be impossible – with the gigantic facility, researchers proved that shrinking and stretching of space was occurring. Together with improved technology and spectacular computational models that researchers in Germany have co-developed, this could pave the way for sources in the unknown corners of the universe. LIGO consists of two four-kilometre-long tubes that run at a right-angle towards one another. A laser beam travels through the tubes, is reflected back at the ends and merged at a certain point. If a gravitational wave rushes over this facility, it shrinks the space – and, subsequently, the length of the two laser beams – for a fraction of a second. This can be substantiated with incredible precision at the intersection point of the two laser beams. Starting in the autumn, the researchers hope to receive a gravitational wave signal, perhaps every week, from black holes, neutron stars or supernovae. The two LIGO antennas registered a tremor that lasted only a few tenths of a second on 15 September and 26 December. An analysis of the two sinus-shaped signals provided a wealth of details concerning the sources. 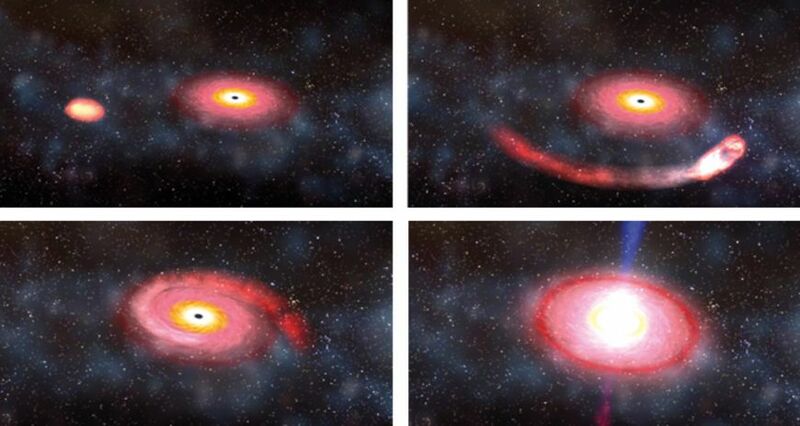 In the first case, two black holes – in a galaxy 1.3 billion light years away – were orbiting around one another and were emitting gravitational waves. This led to a loss of kinetic energy, whereupon they came closer together in a spiral-like course until they collided and merged into a new black hole. In the final two tenths of a second, the two celestial bodies emitted 50 times more energy, in the form of gravitational waves, than all of the stars in the universe together in the form of light and other electromagnetic radiation – this explained the first tremor, which was recorded by the LIGO detectors. The second event on 26 December stemmed from a similar occurrence in which the two black holes were somewhat smaller. Both the retrieval, from an incessant stream of data, of a gravitational signal lasting only a few tenths of a second, as well as the subsequent analysis thereof, form a focal point for research at the Max Planck Institute for Gravitational Physics in Potsdam-Golm. The main problem involves the Einstein equations, which are used to calculate curved space. They are so complicated that it was not possible to calculate, until about ten years ago, the orbit of two black holes around each other. The computer program crashed after only one orbit, or provided nonsensical results. The Max Planck researcher Alessandra Buonanno has developed new approaches that have enabled the current discovery and analysis of the data. Her team calculated the expected gravitational wave signals for a quarter of a million possible double-systems. These serve as a kind of pattern catalogue for finding a wave in the data, and ‘distilling’ the physical information from the wave form. These improvements were also one of the reasons for the current discovery. Starting in the autumn of this year, the intention is to restart the two highly-sensitive LIGO antennas. Then the researchers hope to receive, perhaps every week, a gravitational signal from black holes, neutron stars or supernovae. ‘We’re finally on the right path to genuine gravitational wave astronomy, and can begin to research a plethora of sources from the mysterious and dark corners of the universe’, said Karsten Danzmann, Director at the Max Planck Institute for Gravitational Physics in Potsdam and Director of the Institute for Gravitational Physics at the University of Hannover: ‘After so many years of research, development and preparation, it is very satisfying to see our vision finally come true’. He and his colleagues were involved significantly here – they contributed to, among other things, the most stable laser system worldwide, as well as a new vibration-free suspension system for mirrors in the LIGO interior. Further facilities with a similar functional principle will be added in Italy, Japan and India in coming years. Together with the German-British GEO600 detector near Hannover, six observatories in all would then be eavesdropping on the universe. Thanks to this network, it will be possible to determine the direction from which the waves are coming. A global network of telescopes will then be alerted at every occurrence to search for a flashing object in the sky. If, for instance, two neutron stars collide, there should be a bright flash from the radio- to the gamma-range, as well as a huge number of neutrinos – a true display of fireworks in all colours of the spectrum.